I was in the bathroom of my hotel room in New York City and noticed some printing on the toilet seat. 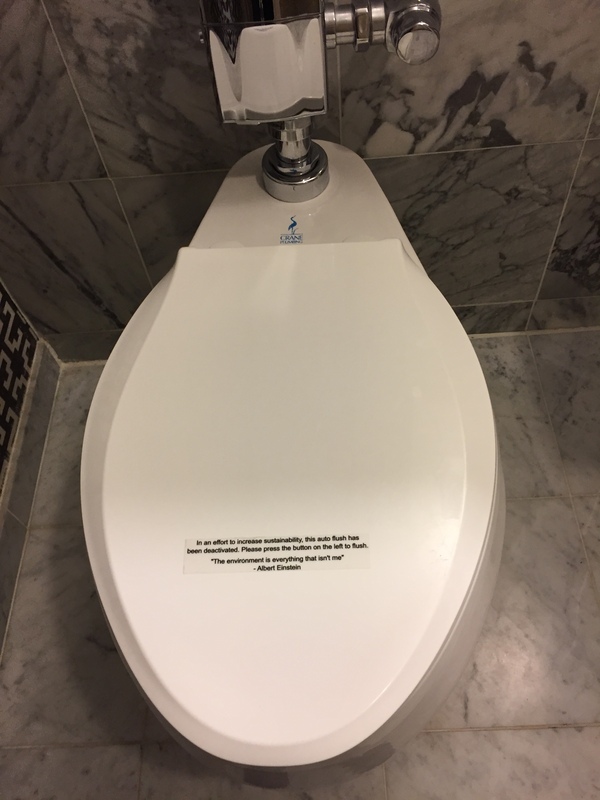 Because toilet seats aren’t the normal forum for announcements by hotel management, I was intrigued and just had to read it. Did Einstein ever actually say that? It’s not easy to confirm whether he did or he didn’t. A Google search will send you to lots of different websites where you can buy t-shirts, posters, or refrigerator magnets with that quote attributed to the Father of Relativity and printed over some peaceful pastoral scene, and also a lot of general quote websites where you can go to find a quote that fits every occasion (including, apparently, a notice on a toilet seat). But those quote websites don’t seem to provide any attribution for the claimed Einstein quote. The closest I could find was a website that referred to the Boston Vegetarian Society as the source for the quote. But I’ve seen no citations to a book or published writing, or a speech given on a particular day, or one of Einstein’s letters. Did one of the greatest minds in human history actually say: “The environment is everything that isn’t me”? As is true with so many facially plausible quotes that are attributed to historical figures and thrown around like footballs these days, it’s really difficult to say. 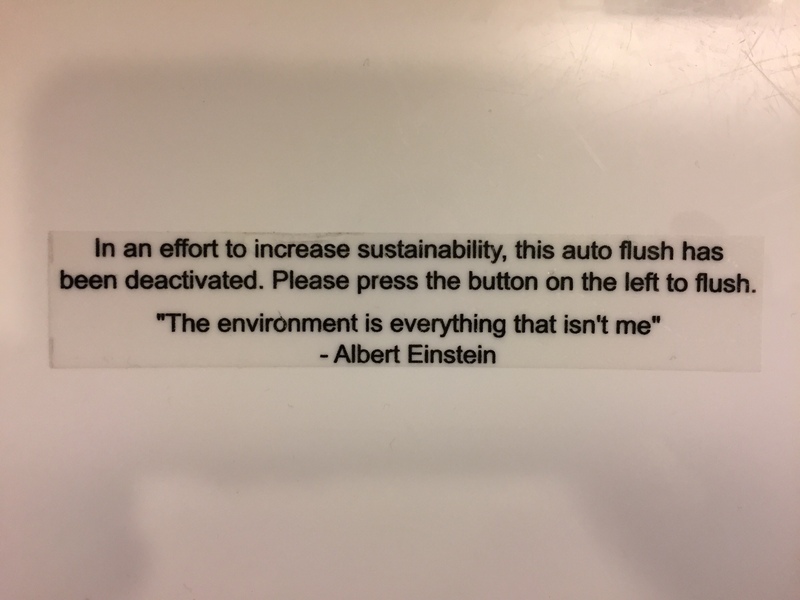 But we can certainly be reasonably confident of one thing: if Albert Einstein did say it, he probably never dreamed that it would end up on the toilet seat of a Manhattan hotel room as part of an announcement justifying a reversion to manual flushing. When murderous cocaine drug lord Pablo Escobar was killed in 1993, Colombian authorities no doubt thought his days of affecting the country were over. They didn’t count on the impact of his . . . hippopotamuses. But here’s the problem — hippos aren’t a native species to South America. In fact, they are an invasive species, and some Colombian conservationists and biologists are concerned that the hippos are wrecking the environment and harming the other occupants on the river, such as otters and manatees. And, because hippos eat on dry land but deposit their waste in water, the hippo discharges are changing the nutrient composition of the river and nearby waterways. Even the hippos’ swimming may be affecting the indigenous species, by affecting the muddiness of the rivers and thereby upsetting nature’s delicate balance. As a result, some ecologists say the hippos need to be removed or their population otherwise curbed — which may be easier said than done, when you’re talking about territorial, thousand-pound creatures living in the wild who aren’t exactly eager to interact with humans. But others say, “not so fast.” They think the escape of the hippos was an inadvertent example of “rewilding” — the concept of putting non-native flora and fauna into an area to fill a vacant ecological niche. It’s like the decision to release timber wolves back into areas of the country that they had vacated decades ago, except in this case some are arguing that hippos are in effect replacing large herbivorous creatures that went extinct in the South American ecosystem in the last 20,000 years — creatures like the toxodont (which incidentally sounds like the name for a dental care product). Still others argue that having a surplus population of hippos in South America is a great thing, just in case the African hippos might be subject to extinction due to changes in their environment. While the debate rages, the hippos continue to enjoy life on the Magdalena River. Their escape and success reaffirms once again what the Jeff Goldblum character said in Jurassic Park: life somehow finds a way. Austin, Texas has come up with an interesting new approach to addressing its landfill and waste issues. Starting Monday, every restaurant and food business in Austin can no longer throw away any food. The initiative stems from a 2015 study of the materials that ended up in Austin’s landfills. The study found that 37 percent of the landfill deposits from businesses was organic material that could have been composted or put to some other use. Accordingly, when the city enacted its Universal Recycling Ordinance, which has the goal of reaching the point of zero waste by 2040, one of the first targets was to reduce, and ultimately stop, the flow of organic material into landfill space. The ban on throwing away food by local businesses is a first step in the process. According to the article linked above, Austin city officials hope that the restaurants and food businesses either donate the food to the needy, or give it to local farmers, or compost it. The affected businesses have to submit an “Organic Diversion Plan” each year. The Austin initiative raises a lot of questions. Aren’t there health risks in giving leftover food to shelters and food banks, and how will they be dealt with? What are local farms and food banks supposed to do with leftover organics they can’t use? How much composting is really feasible, and what kind of environmental and health and atmospheric (i.e., odor) impact will lots of new composting piles and devices have? How is the city going to police compliance with the ordinance, and how many additional city workers will need to be hired to accomplish that? How much will prices charged at Austin restaurants have to increase to pay for the new activities that restaurants and food businesses will have to undertake? And, ultimately, when will individual residents in Austin have to establish their own compost piles to meet the zero waste goal? Cities and counties are often viewed as laboratories of our democracy because they are willing to experiment, on a small scale, with different and creative potential solutions to societal problems. Local governments have long understood that we can’t simply keep burying trash and other discarded materials in landfills and have been looking for workable alternatives — so far, without a lot of success. I expect that many local governments will be paying careful attention to how Austin’s experiment with its Universal Recycling Ordinance works. Depending on how some of the questions noted above ultimately are answered, we may all see more composting in our future. In the mood for some good news — perhaps, good news that hasn’t gotten much attention? How about this: the most recent United States Environmental Protection Agency report on the quality of our air shows that the America has made remarkable progress in reducing air pollution. The EPA report is called “Our Nation’s Air 2018,” and it’s an eye-opener. It shows large — in some cases, huge — decreases in the concentrations of air pollutants just since 1990. Since then, carbon monoxide is down 77 percent, sulfur dioxide is down 88 percent, lead is down 80 percent, and various types of particulate matter are down between 34 percent and 41 percent. Ozone emissions are down 22 percent, and nitrogen dioxide is down 50 percent. The report notes that since 1970 — when the federal Clean Air Act took effect –“the combined emissions of the six common pollutants (PM2.5 and PM10, SO2, NOx, VOCs, CO and Pb) dropped by 73 percent.” The total number of “unhealthy air quality” days as measured by the EPA also has fallen dramatically. And what’s really amazing is that these significant overall declines in air pollutants have occurred at the same time that both America’s population, and its economy, have grown substantially. It’s a classic example of how real environmental progress can be made in a way that doesn’t cause total economic disruption. To be sure, there is still work to be done, and I’ve been to places in America — like southern California — where from time to time you can sometimes still see smog and visible air pollution. But that shouldn’t detract from the success the country has achieved in getting to cleaner air. Remember that the next time you take a deep breath of sweet, clean air. Our tiny backyard features a flowering vine that has been growing like crazy. It completely covered the wooden trellis that is its intended home, then started to grow over the top of the small tree our landscaper had positioned next door — which obviously wasn’t good for the tree. To deal with the problem, we had to redirect the vine away from the tree. But how? Our solution was to move our birdhouse stand to the other side of the vine, gently extricate the vine from the top of the tree, and loop the vine around the birdhouse and its stand. It worked like a charm. Now the vine has plenty of room to grow, the little tree is flourishing again, and the birdhouse and its bright colors look beautiful against the vine’s green leaves and deep purple flowers. Now, if we could just get a family of birds to move into the birdhouse . . . .
For some time now, Japanese people looking to reduce the stress of everyday living have been heading to the forest. Their approach to shinrin-yoku is simple: go out into the woods, shut off your cell phone, and take in the forest atmosphere to the maximum extent you can, without a specific goal or destination in mind. Use your senses as you wander. Breathe in the cool fresh air that leaves your nostrils tingling. Touch the rough tree bark and the soft moss. Listen to the wind rustle the leaves, and hear the birdsong. Sit down on the ground or a fallen tree and smell the humid mix of growing plants, decaying wood, and moist earth. Feel the tree shade on your skin. The proponents of shinrin-yoku say that it produces all kinds of health benefits, in addition to stress reduction: improved functioning of the immune system, reduced blood pressure, improved mood and energy, heightened mental acuity, and better sleep. In short, regular leisurely, relaxed strolls through the woods can provide the kind of mental and physical health benefits that stressed-out Americans typically try to obtain through prescription drugs or some other artificial means. Should this come as a surprise? One of the weirder things about modern America is how resistant some people are to actually experiencing nature. Every morning, as I’m on my morning walk, I travel past a small health club where people are jogging and walking on treadmills, watching TV — when they could be jogging around the same park I’m heading to only a few blocks away, where they could breathe some fresh air rather than stale sweat smells, experience the morning quiet, and chuckle at the quacking ducks waddling by. Why make that choice? Why do people hop in their cars rather than walking, even for short distances? I don’t think you need to plan a trip to a primeval forest to experience the benefits of shinrin-yoku. I think any effort to get out into the natural world, in quiet way, walking at your own pace and listening and looking and feeling, is going to be a good thing on more levels than we can count.